The University of Ulster will play its part in hosting one of the largest celebrations of traditional fiddle music and dance to take place on the island of Ireland. 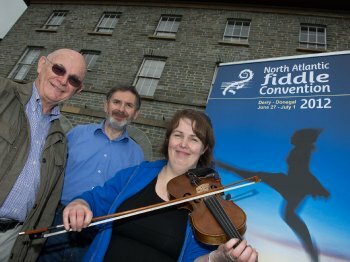 The North Atlantic Fiddle Convention, NAFCo, which runs at venues across the north-west from June 27 until July 1, features a plethora of concerts, music sessions, talks, workshops and master-classes. The University’s Magee campus will host two academic conferences as part of the international event. ‘Ã“n gCos go Cluas’, (From Dancing to Listening), is a unique conference which addresses a challenging issue for traditional music in the 21st century – the shift of emphasis from music for dancing to music for listening. “Traditional music has moved from a primary purpose of servicing dance, to expressing artistic preference. This is particularly so for the fiddle, one of the most versatile, accessible and universal of acoustic instruments,” explains NAFCo Convention Convenor, Dr Liz Doherty, who is a Lecturer in Traditional Music at Magee. Dance Research Forum Ireland will host their fourth international conference in tandem with NAFCo, focussing on ‘Connecting Communities through Dance’. Both events will take place in the Foyle Arts Building at the Magee campus. The Great Hall at Magee will also play host to NAFCo’s first International Youth Camp. “Over 200 young fiddlers from Sweden, Scotland, Ireland and Canada will come together to participate in a week of workshops, sessions and other activities,” said Dr Doherty. “The young musicians will then showcase their work, including the premier of a newly commissioned piece entitled ‘100 Fiddlers at 55 Degrees North’ by Neil Martin, on Saturday June 30 as part of the ‘Fiddles on the Foyle – Family Day Out’.